What Would Go with a Black & Blue Skirt? What Goes With Navy Shorts? You can mix your navy polka-dot skirt with other patterns -- even a smaller dotted print. 3 What Would Go with a Black & Blue Skirt? 4 What Goes With Navy Shorts? There's something flirty and fun about polka dots that can make such a skirt a welcome addition to your wardrobe. If you're worried about the dots looking childish, though, a neutral option like navy polka dots is an ideal option to make the piece feel more sophisticated. Choosing a navy skirt also allows for plenty of outfit possibilities -- some of the best matches may already be hanging in your closet. 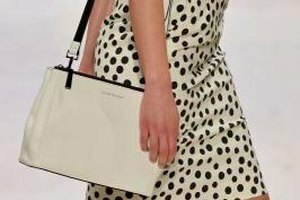 Since polka dots are such a statement pattern, a simple look that stays within the navy and white color scheme is a smart way to style your skirt. A casual white T-shirt or tank is an attractive, low-key option; add a pair of navy ballet flats or white sandals for a relaxed weekend outfit. If you have a navy polka-dot pencil skirt that you want to wear to work, wear it with a white or navy button-down blouse and navy pumps. Pair the ensemble with a simple pearl necklace or thick gold chain for a polished, professional look. Just because your skirt has a whimsical polka-dot pattern doesn’t mean you can’t play with color. The combination of navy and white can actually function as a neutral item, so you can pair your polka-dot skirt with a variety of colorful shades. Go for a nautical-inspired look by wearing the skirt with a red blouse; pair it with navy or white wedge boat shoes and gold jewelry to complete the ensemble. Pale yellow is also a good option with navy -- wear a navy polka-dot pencil skirt with a butter V-neck sweater and navy peep-toe pumps for a work-appropriate outfit. In the summer, a bold coral tank or tee can really pop with a navy dotted skirt. While a polka-dot skirt is certainly fun, it can start to look cartoonish if you’re not careful. To avoid a cutesy vibe, pair your navy skirt with some edgy items to toughen up the look. Wear your flirty polka dots with a basic white tee and a black studded leather jacket to channel your inner biker -- add a pair of black tights and motorcycle boots, and your navy dotted skirt won’t seem so girly anymore. If you want to scale back the toughness a bit, wear the skirt with a distressed denim jacket and ankle booties for a balance of hard and soft. If you really like to stand out, don’t be afraid to pair your navy polka-dot skirt with another patterned pieces for an eclectic look. A floral, plaid, animal print or even paisley top can work; but to keep your outfit from appearing too busy, choose a pattern that also has navy in it to unify the various pieces. Pair a navy and yellow floral blouse with your skirt or try a navy and light blue leopard-print tank to make a statement without looking tacky. What Goes with a Red & Black Plaid Skirt? What Colors Go Well With Heather Gray? How Do Girly Girls Dress With Skinny Jeans?